The natural and effortless way to press up to 6 litres of fruit in one go. 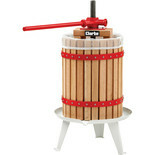 Ideal whether you want to make wine or cider or just want wholesome fruit juice. Designed for quick assembly and easy use. The natural and effortless way to press up to 12 litres of fruit in one go. 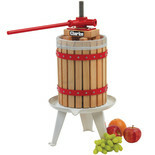 Ideal whether you want to make wine or cider or just want wholesome fruit juice. Designed for quick assembly and easy use.